I started with lamb, representative of Australia/New Zealand (where sheep outnumber people), potatoes (because Peru is home to the International Potato Center), cooking techniques and spice blends from South Asia/India and couscous from North Africa/Middle East. 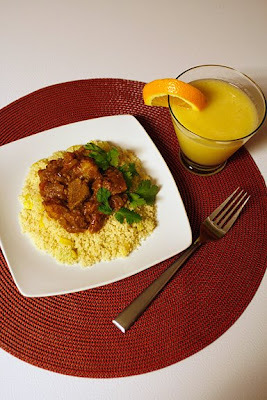 To pair with this hearty, spicy dish, I created a tropical fruit smoothie, using fruits grown along the equator: mango, pineapple, banana and orange. All blended with ice -- you know, the same stuff that makes up much of Antarctica. On with the recipes and plating! 1. 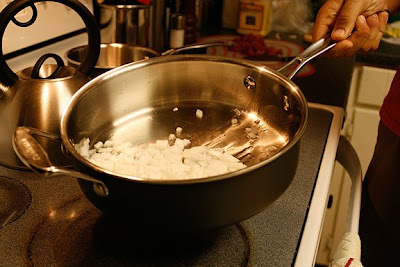 Start by sauteing the onions and garlic in oil over medium heat. 2. 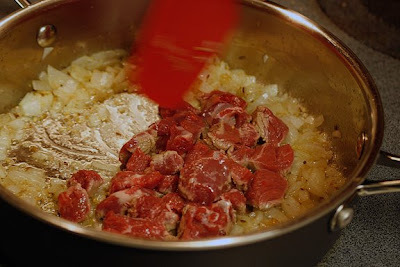 Add the cubed lamb and cook until just browned. 3. 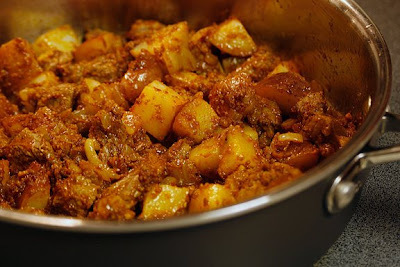 Stir in the curry paste and cook for a couple more minutes, then add the tomatoes and potatoes. 4. Simmer for another 15 minutes, stirring occasionally. Give it a taste and add some extra cayenne if you like your food a bit spicier. 5. Meanwhile, saute the squash in a bit of oil. 6. Cook couscous as directed, mix in squash once done. 1. Skin the mango and cut around the core. 2. Add mango flesh and 1 whole (peeled) banana to the blender along with the pineapple juice and ice. 3. Blend, then pour into a glass with an orange slice to garnish. ...and to play along with the theme, I've plated the dish to look similar to a volcano -- I hear they're created with some of this plate-shifting action. Garnish with some fresh herbs, such as cilantro. 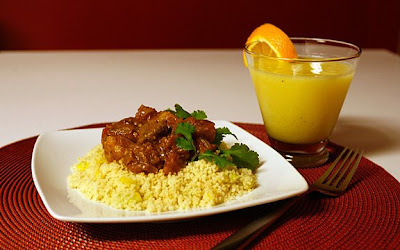 The cool tropical flavors of the smoothie balance the spiciness of the curry dish nicely.